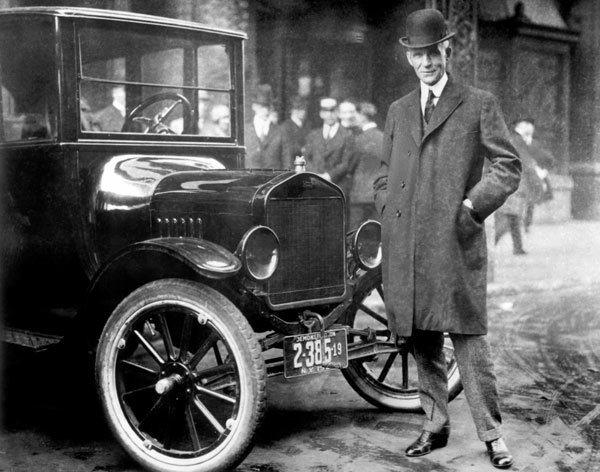 100 years ago, in 1903 Henry Ford introduced the first mass produced car known as the Model T. Richard Snow, former Editor of American Heritage magazine, has documented Ford’s early years as an inventor and businessman in his new book, I Invented the Modern Age. The first Model T was made available to the public in 1904. It had an open top and needed to be cranked in order to start. It was also the first mass produced car that had an engine block made from one piece of steel. The story tells of Ford’s first trials and errors, working with factory workers and going to court more than once for wage and patent laws. In 1914, Ford increased his worker’s wages to $5 a day while at the same time cutting their work day down to eight hours. This is one of the highlights in his career. Snow covers all the problems and rejoices Ford Motor Co. experienced with the production of the Model T until it was cut from the Ford line in 1927. To find out the whole beginning of Ford, check out Snow’s book, I Invented the Modern Age-The Rise of Henry Ford.